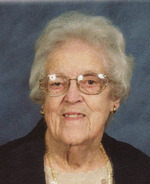 Ruth J. Briggs Straub, age 89, of Sardis, Ohio died Wednesday August 1, 2012 at the Woodsfield Nursing & Rehabilitation Center. She was born August 18, 1922 at Antioch, Ohio a daughter of the late Ernest & Mary Stacy Briggs. Ruth was a member of the Laings Church of Christ, and the Woodsfield AARP. Preceded in death by her husband of 50 years; Charles H. Straub, one sister; Marie Thompson, and three brothers; Everett, Lawrence, and Glen Briggs, and one great granddaughter; Noel Habig. She is survived by two daughters; Joyce (Charles) Ottinger of Imlaystown, New Jersey and Rita (Richard) Habig of Piedmont, Ohio, two sister-in-laws; Esther Briggs of Marietta, and Mamie Briggs of Woodsfield, five grandchildren; Paul (Denise) Kopyciak, of Kent, England, Rich (Liz) Habig of Cadiz, Jeff (Sandy) Habig of Colerain, Cindy Turley of St. Clairsville, and Randy (Luann) Habig of Mt. Pleasant, Ohio, thirteen great grandchildren, and nine great-great grandchildren. Friends received from 2 – 4 & 6 - 8 p.m. Friday at the Bauer -Turner Funeral Home Woodsfield, Ohio, and from 10 a.m. until time of Service at 11 a.m. Saturday August 4, 2012 at the Laings Church of Christ, in Laings, Ohio. Burial will be in the West Union Cemetery near Sardis, Ohio.